A wonderful collection of some of the best-loved rhymes that little children love to hear - and do the actions to - again and again. Rhymes include: ‘The Wheels on the Bus’, ‘Here we go Round the Mulberry Bush’, ‘Head, Shoulders, Knees and Toes’, and ‘Row, Row, Row your Boat’. Illustrated tabs enable young children to find their favourite rhymes quickly and easily. 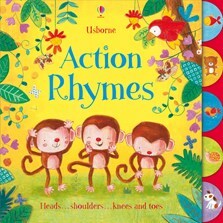 Watch the actions and songs demonstrated on the Usborne Quicklinks Website. We loved doing the actions to the six animal rhymes in this nursery book. Picture tabs on the edge of the study pages enable little ones to easily turn to their favourites. This is a wonderful collection of some of the best-loved rhymes that children will want to hear, and do the actions to, again and again.